Okay everyone I think I've gone bonkers with keyboard shortcuts but figured I'd share mine to see what everyone else has. 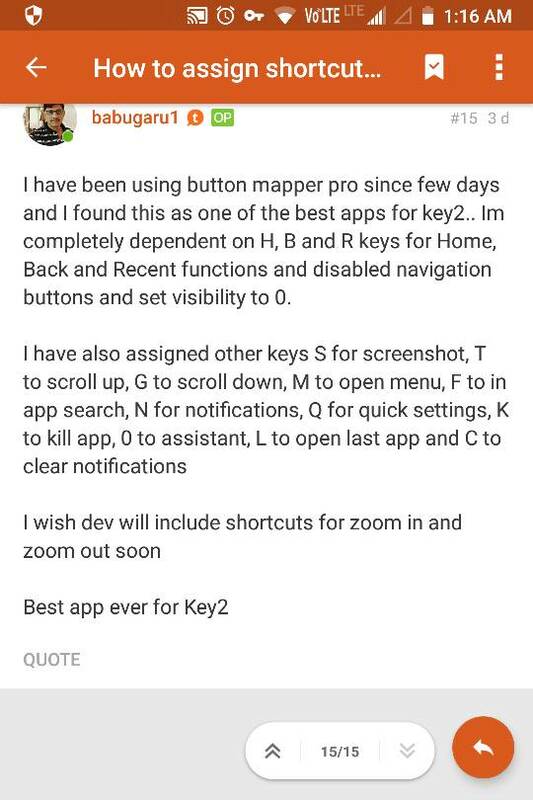 I've used Button mapper to give me a 3rd shortcut for many keys. If you add a key with button mapper and change its "long press" (>1000ms) you can add yet another shortcut. Vistaus and AbeM25 like this. That's awesome.. but honestly, how do you remember them all? Excellent, I have been doing a lot of research to use my key2 without touching screen as far as possible. And I'm also using button mapper which is the best app and saving grace for me. I'm almost using all the available functions with that app. I always set "U" to be the calculator, habit from the shortcut that existed on old school blackberries. Can you explain how you're using button mapper? Love the app so would be interested in doing more with it! I can't answer here how to use button mapper, however if you have any specific question I can answer. If you want to learn, how to use button mapper, then you can watch any youtube video. I know how to use it - I was just curious as to what youre using it to do? Map buttons in particular apps? Or just other long-press shortcut keys like I'm using it for? I wish there was a way to press a single shortcut key and get a popup menu so one key could potentially launch multiple apps. Example: Press M and get a popup menu allowing me to launch Maps, MyFitnessPal, Messages, etc. or W to launch WhatsApp, Waze, or Weather. This would make it really easy to remember hotkeys. Yes, it would add one more keypress or menu selection, but I'd like to have the option. This is totally possible - I've actually done this same thing. I've made a long press for all my two-factor authentication apps to show up under one keypress. I used tasker and scenes to accomplish this - I hold down the key and the scene pops up with my three apps - Authy/Microsoft Authenicator/Google Authenticator. Works well! Sounds cool. I've not yet used tasker or scenes. I'm interested in more detail. Yeah exactly - scenes have an option for a Menu, on which you can place any number of icons you'd like. Here is a screenshot of when I hit the shortcut key on the keyboard for my 2-factor authentication apps. Fantastic! I downloaded tasker a bit ago, setup a scene with 4 icons, each of which launches a corresponding app. I created a task to display the scene. Then I assigned that task to a keyboard shortcut. Pressed the keyboard shortcut and got the scene, allowing me to launch any 1 of the 4 apps. That's exactly what I wanted! So, when I only have 1 or 2 apps for a keyboard shortcut, I can use the normal methods of assigning a long and/or short press. If I want 3 or more actions for a single shortcut, I can create a scene displaying the app icons, create a task, and assign that task to the shortcut. I won't need scenes/tasks all that often (I think), but there are times when several apps are most easily remembered by the starting letter or other memorable mnemonic . And not everything needs to be started with a hotkey, but for things used a lot, it's very handy. Interested to hear what you're doing on your end with the scenes! I like keyboard shortcuts, but my goal isn't to have one for every app. I just want shortcuts to the things I use most often, and things I might want to access while I'm in the midst of something else. Most of the time, I'm perfectly fine hitting the main screen and picking the app from a folder. is the scenes function in tasker easy to set up? I use tasker a fair bit but have never known what scenes is for. basically you need to insert a menu with a grid if items (app icons, etc). It's working very well so far, like the solution! Let me know if any specific questions! One q, how do u prevent to launch shorcuts when texting?... can't find the option of the app and I feel really annoying when using whatsapp or just texting an email. Ok, but it does on Blackberry launcher, when I text anything it runs the shortcut if I don't writte little fast or if I press the letter alone. I suppose It doesn't works like this in other launcher or just use long press to avoid it? That should not be happening when you're texting someone. The launcher should only launch shortcuts when at the home screen and/or when pressed with the shortcut key held down simultaneously. Sounds like something might be wrong with the device? Ok there is a misunderstood. Blackberry shorcuts works well for me. I mean when I use Button Remapper app , if I remap any key , it activates the remapped function even when I'm texting. Its the only annoying thing I found with that app. Physical KeyBoard Gestures - Are You Using Them?